From empty swimming pools to old vans, Robert Montgomery takes the written word to the most physical of spaces. People like it so much, they've taken to getting tattoos of his work. He has been called a vandal, a street artist, a post-Situationist, a punk artist and the text-art Banksy. 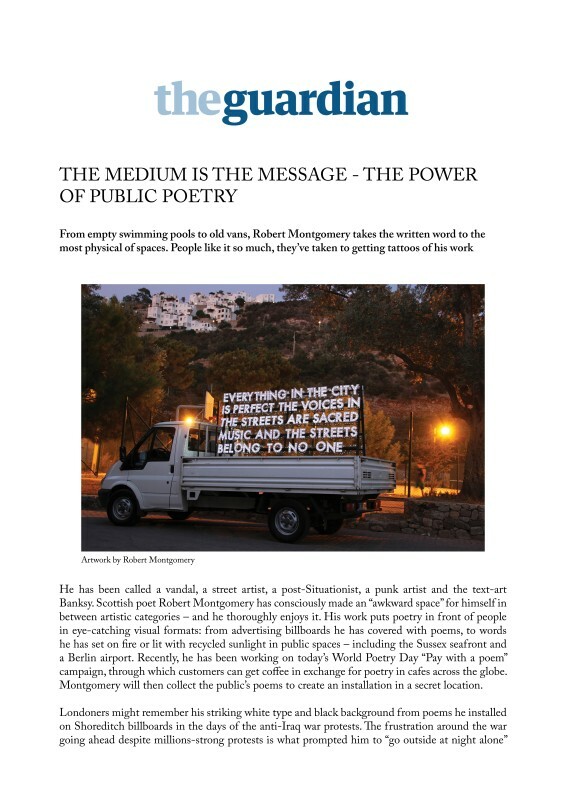 Scottish poet Robert Montgomery has consciously made an "awkward space" for himself in between artistic categories - and he thoroughly enjoys it. His work puts poetry in front of people in eye-catching visual formats: from advertising billboards he has covered with poems, to words he has set on fire or lit with recycled sunlight in public spaces - including the Sussex seafront and a Berlin airport. Recently, he has been working on today's World Poetry Day "Pay with a poem" campaign, through which customers can get coffee in exchange for poetry in cafes across the globe. Montgomery will then collect the public's poems to create an installation in a secret location.